Washing clothes is a chore I actually quite enjoy. It's not really a chore to me at all. I always get lulled in by how easy it is to chuck dirty clothes into my washing machine and how nice my laundry powder smells when I scoop it in. I especially enjoy hanging my washing on the line. 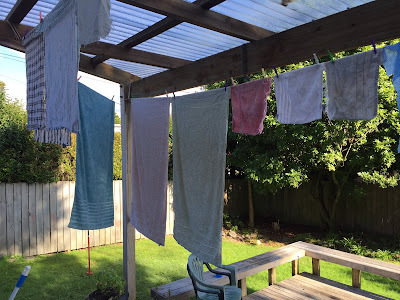 It gets me outdoors for a few minutes of fresh air and I'm addicted to the smell of sun-dried washing. Where my washing routine usually falls down is in the folding and putting away. It's mostly just a timing thing. 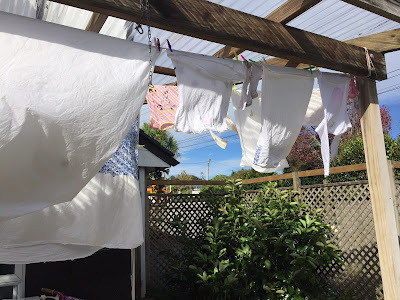 My washing tends to finish drying at the end of the day, which is when I'm busy doing dinner prep and dishes, and getting kids bathed and into bed. Sometimes I have the energy after that to put my washing away, sometimes I don't. Anyhoo, today I want to share with you how I dry my washing with the minimum dryer use possible to save on our power bill. Obviously, on a sunny day, I hang the washing out on our main washing line, which is handily located just outside the laundry door. Lately it has poured buckets from the sky every day, so I haven't been able to use the outdoor washing line at all. Instead, I've been hanging things under cover on our deck to dry. My friend, James, helped me string a washing line there just before the weather turned feral, and it has helped so much. Now I want to string more washing line up, because I think this is going to be my go-to drying space over winter. Whites drying under cover on the deck. Towels drying under cover on the deck. Even on rainy days, the washing gets mostly dry out here, so I always hang it up for a while to blow the moisture out of it. Then to finish drying it, if it's not quite there, I either put it in the dryer or, if there are only a few pieces to finish off, I hang them in my hot water cupboard. Drying lines in hot water cupboard. I drape as much as possible directly over the hot water cylinder where it's hottest, but I've also strung a couple of lines of wire across the front of the hot water cylindar to maximise drying space in the cupboard. It always amazes me how fast things get dry in here. If I'm doing several loads of washing a day, the first load is always ready to pull out of the hot water cupboard by the time the next load needs to go in. So that's how I save money on our power bill by making use of passive solar energy and the heat that's already being generated in my hot water cupboard. When I do use the dryer, it is for a very short time as most of the drying has already happened on the line. I'm also now experimenting with washing in cold water to make further savings on our power bill. 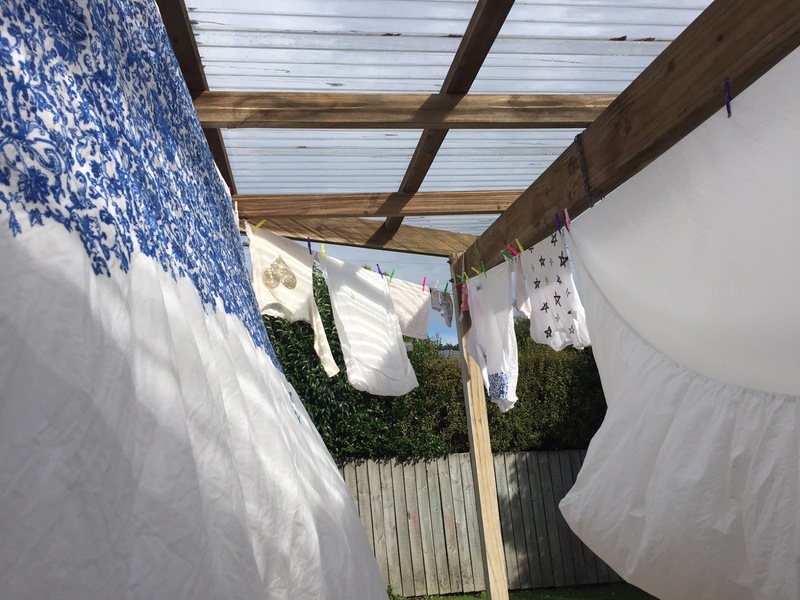 I've always done warm washes, with the occasional hot wash to clear out the washing machine and sterilise bed sheets, but after reading this post over at Frugal Girl, I realise there are big savings to be made if I utilise my cold wash more. And since I'm drying out in the sunshine, my washing is getting sterilised anyway. I think to be successful with cold washes, I will need to soak really dirty items first, but that's tricky since I don't have anywhere to do that in our small laundry. 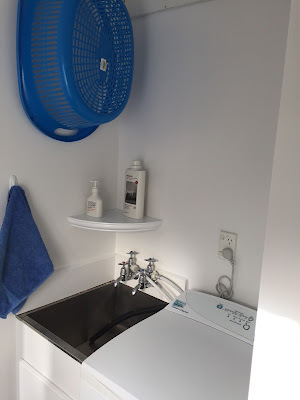 I could do it in the laundry sink, but the washing machine drains directly into that and I don't want anything blocking the drain hole. I'm sure I'll figure something out. How do you save money on your power bill? Let me know in the comments. I always use old water and a liquid laundry detergeant. I often put jy washing on a little fold away line on my back porch ( there is only hubby and I ) and in the winter months do as you do and finish it off in the hot water cupboard. Every so often say couple of months I pour in some white vinegar and do a full cycle (empty)hot wash to clean ut out. Happy washing/drying!!!! I must try the white vinegar hot wash cycle. Do you notice much of a difference after you've done it? Good to see that the washing line is being put to good use, and more importantly hasn't fallen down yet! It's doing awesomely! I'm just wondering if I can undo your knot to try and stretch another line along. I'm going to give it a go. We kiwis just love fresh air drying don't we. Like you, i'm lucky to have the deck. I really miss the hot water cupboard for airing since we got infinity gas. 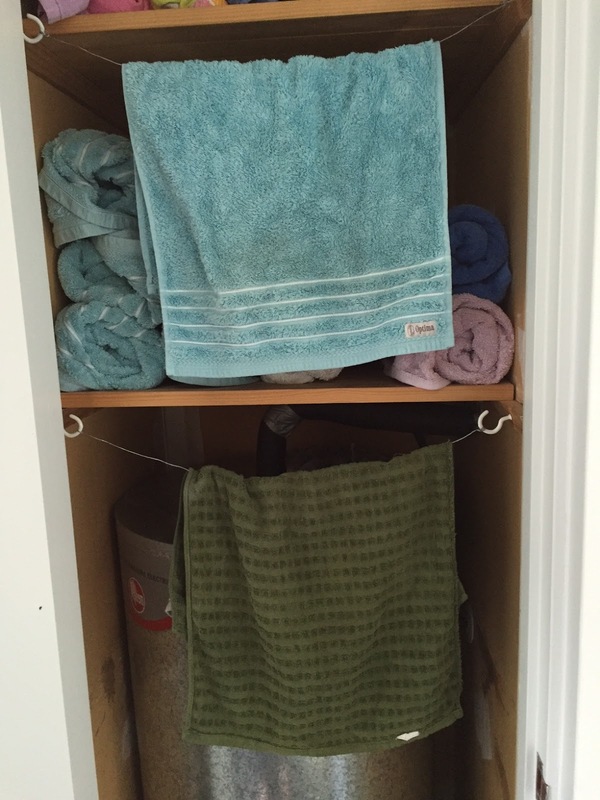 This is the first house I've had where I could do the hot water cupboard thing, and it's great. The hot water cylinder does take up a lot of room though, so you've probably gained a big storage cupboard by switching to gas. I have washed almost exclusively in hot water for the last 35 years. I divorced and needed to save every bit of money I could. I just love to hang clothes outdoor to dry. In the winter I hang clothes outdoors unless it is below freezing, raining. when hanging clothes, like shirts for exemple, or jeans, I put them on hangers, coat hanger if necessary, so that it prevents the necessity of ironing. It's even better when you have the wind blowing between all the clothes.So that I put the sheets and bath towel absolutely flat. Without ply. With those precautions, I never iron either. I use no electricity and no time to ironing. I live in north of France, where it often pours and for that reason, I even have curtain bars where I hang my hangers in the staircase and in the buandery. ( I had a family with 5 children at home.) I always like reading your posts. Thanks a lot. That's a cunning time saver. We just wear clothes that don't need ironing, because that is one chore I do not enjoy. But I'll keep in mind your hanger tip the next time I wash one of Paul's shirts. Thank you. Ich habe vergessen etwas zu sagen. When hanging wet clothes on bars or hangers, never use wooden bar or hangers. You would have stains. Even with new woodpegs, I've had stains. I have 2 clothes racks in my garage, which is very warm on sunny days. Towels and sheets go outside on fine weekends. Too late home during the week, it would be damp. Have a great hot water cupboard too, to finish things off. Sometimes a clothes rack comes into the lounge with heat pump and HRV going. We have some lines in our glasshouse and in winter or wet days hang our washing there which works great. 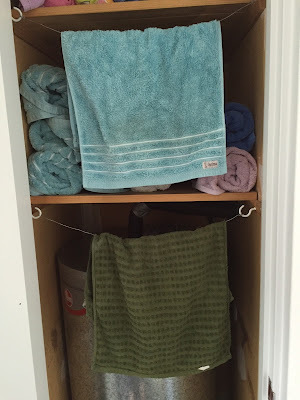 Love the idea of a few lines in airing cupboard to finish off or put towels - must look into it. Thanks for another great read. That's a clever use of your glass house!